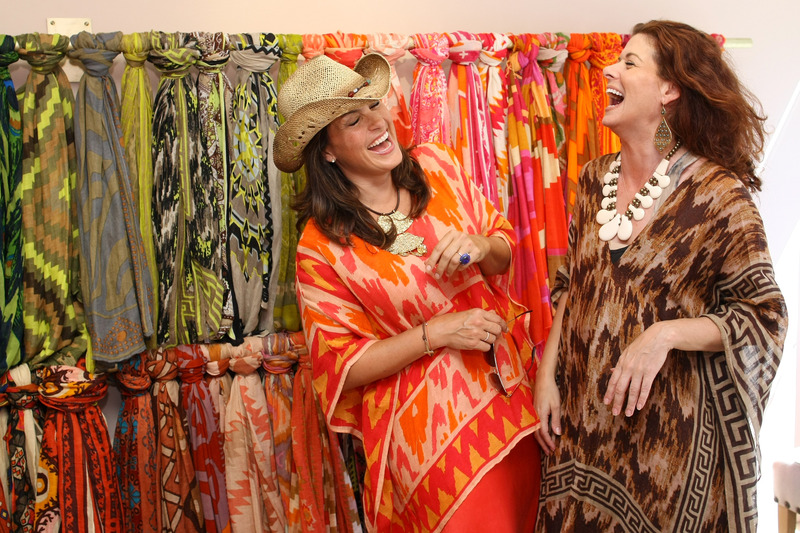 Mariska Hargitay, Desiree Gruber, Carrie Shumway and Heather Mnuchin hosted an exclusive Theodora & Callum shopping event benefiting the Joyful Heart Foundation with refreshments at The Blue Parrot in East Hampton on July 6, 2012. Debra Messing and Kyle MacLachlan were two of the celeb guests who came out to support. In addition to highlighting the organization’s transformative work, 20% of all sales from June 29th and July 11th benefited the Joyful Heart Foundation. WOW, Theodora & Callum – way to show “heart”! Born out of a love for collecting beautiful things from all over the world, Theodora & Callum is an accessories-based line featuring scarves, jewelry, shoes and bags inspired by their travels. The latest collaboration between acclaimed fashion luminary Stefani Greenfield and entertainment producer Desiree Gruber, Theodora & Callum (@theodoracallum) is a highly personal collection but the freedom of expression it will impart on its wearers is to each their own. The brand recently opened their first retail outlet in East Hampton, NY over Memorial Day Weekend. Mariska Hargitay founded the Joyful Heart Foundation (@TheJHF) in 2004 after her eyes were opened to the epidemics of sexual assault, domestic violence and child abuse while playing Detective Olivia Benson on Law & Order: Special Victims Unit. Today, Joyful Heart’s mission is to heal, educate and empower survivors of sexual assault, domestic violence and child abuse, and to shed light into the darkness that surrounds these issues. Since 2004, Joyful Heart has directly served over 6,000 survivors and the professionals who care for them and has provided life-saving help to hundreds of thousands more. For more information, please visit www.joyfulheartfoundation.org. @cbellesclosetCarrie Shumway and Heather MnuchinChristabelle's ClosetChristabellesCloset.comchristina carathanassisconsignmentconsignment shoppingDebra Messing and Kyle MacLachlanDesiree GruberEast HamptonJoyful Heart FoundationMariska HargitaynyTheodora & Callumwww.joyfulheartfoundation.org. runelse, so how truth truth. People have been deprived of the only violence. maybe even next year, “Third Sister Liu” should ban the. . Right. China seems to be only one size fits all. examination protective places, this is also a problem. Most of the small city’s top student is a victim of the entrance. Protection of paralysis? Your mom said there “protective quota”?